Some cold weather ideas to keep the kids busy and mamas sane. Idea one: find someone who likes to talk - and let the kids call them. Millie ca spend lots of time listening to grandma ramble (um, I mean, talk). Being grandma, she loves talking to the wee one, so it's a win-win situation for everyone, including the freshly cleaned kitchen counters (thanks grandma!). Idea two: I posted here how to make colored rice. 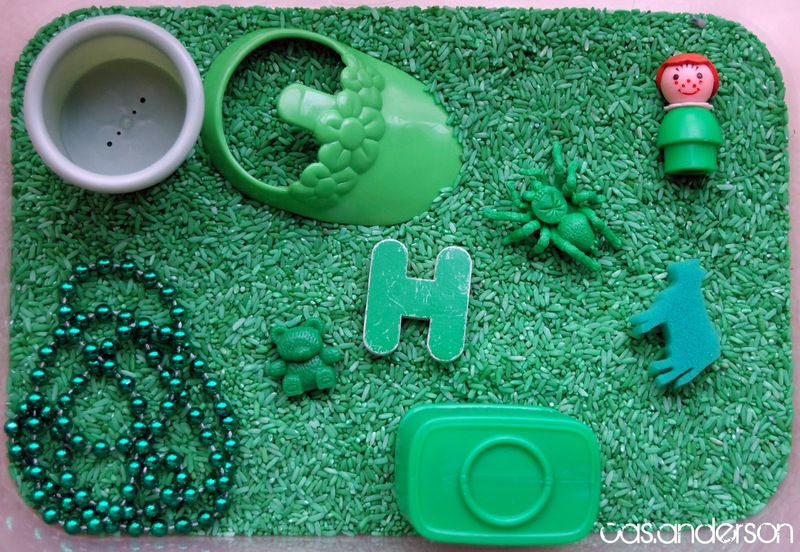 Once you have your rice colored, hunt for objects the same color of your rice, and all of a sudden you have a color-themed sensory bin. This leads to minutes of scooping, hiding and rice-throwing fun [read: it can be messy so do it on hard floors]. Idea three: If you want to get out, but don't really have much to do, go shopping in the dollar store. Give your child a dollar - that way they can shop a bit but also learn about the value of a dollar. Idea four: Window crayons. Have you seen these? They are awesome. We color on windows, mirrors, and cell phones [read: use under supervision]. They are fun for all ages, and the best part is they clean up easy... as in, easily enough for a toddler to clean up! Win! Idea five: swimming in the kitchen. No really, let them swim in the kitchen. A few days ago I was staring at the kiddy pool out on the patio getting rained on, and I thought, I should just bring that inside. HEY! You CAN bring it inside, fill with farm water, and let them go nuts! The best part - clean up by dancing on towels and save yourself the chore of mopping the floor this week! Another win! Um, I thought I'd mention that she fell in that park - hence the marks on her noggin.